A mouthguard is a protective device for the mouth that covers the teeth and gums to prevent and reduce injury to the teeth, arches, lips, and gums. Mouthguards are most often used to prevent injury in contact sports, as a treatment for bruxism or TMD, or as part of certain dental procedures, such as tooth bleaching. Mouthguards are used in sports where deliberate or accidental impacts to the face and jaw may cause harm. Mouthguards may also prevent or reduce harm levels of concussion in the event of an injury to the jaw. Many sports, schools, or local state health laws make the use of protective mouthguards compulsory for participants. 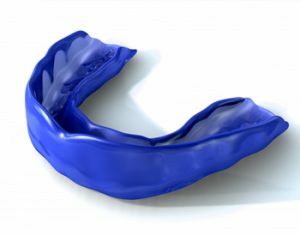 Mouthguards may be used as splints to treat temporomandibular joint (TMJ) disorder and bruxism (teeth grinding). These devices are manufactured in a pre-formed shape in various sizes to fit the user’s mouth. They offer nearly no adjustments. The only adjustment possible is minor trimming with a knife or scissors. Made from a thermoplastic material that is manufactured in a pre-formed shape, these guards come in various sizes that can be adapted to fit more closely to an individual’s teeth and gums. This is accomplished by heating and molding the guard, such as by boiling it and then placing in the mouth. These mouth guards are usually made of ethylene-vinyl acetate. An impression of the user’s teeth is used by specialist manufacturers to create a best-fit mouth protector.